Daypacks can become pretty useful when you are going for 1-3 camping activity days. This type of bag got a lot of room for your necessities. The SOG Ninja Daypack is not a tactical gear, but rather a basic bag. If you want a pack that you can daily carry or just wear around occasionally, SOG Ninja Daypack can be a great choice that you can consider. 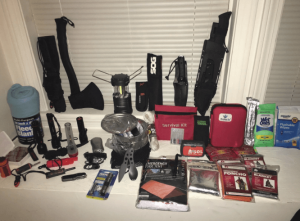 The following is an SOG backpack review that you can use as a reference and so you can get the important details about the product. Whether you are a student, a sportsman, a geologist or a tactical professional, this SOG Ninja Daypack will be a useful backpack to have all your necessities well-organized, intact, and secure while you are on the move. With rough & tough build-up, this daypack has numerous compartments and pockets. True to its name: Catchy and stylish as a ‘Ninja’ and it is for the daily use as a ‘Daypack’. It is very popular among the tactical gear fans. Made with good quality material to ensure durability, the smooth polyester fabric, the sturdy and MOLLE attachments for extra item add-ups. The hydration system will be quite useful in storing your water bottles. This basic bag is for everyone”. With its style, utility and easiness this backpack is for all ages. For carrying all tactical tools, school and office stuff and for field works this is your dailypack. Once in your hand, you won’t let it go forever. The SOG Ninja Daypack is well built with smooth polyester fabric and is mainly purchased for its roomy compartments. The MOLLE equipped feature, along with the hook which allows you to add extra items during field trips and travel. The loop flag patch compatibility feature this bag has is the same as SOG ninja daypack digital camo, which is very effective for travel and military use. . It measures 17.3 x 11.9 x 3.6 inches and weighs 2.4 pounds. It has strong and durable shoulder straps which is yoked styled and the plus point is that the straps are adjustable with sternum slider. The back is also comfortable as it is padded mesh back, which makes it fashionable and easy to carry. There a lot of available compartments and pockets. The bag has a large zippered opening where you can put in your items like books, compasses, gadgets, and other tactical tools. The main compartment measures 18 inches in height (tall), 9.5 inches in the breadth (wide) and 7 inches in the depth. It has multiple pockets which make us carry a lot of stuff. In terms of the daily use, it can easily carry a 15-inch laptop. The four main compartments really make us comfortable in adding up as many things as you want. The bag incorporates the MOLLE feature. The “MOLLE” stands for Modular Lightweight Load-carrying Equipment. Same as the SOG military backpack, it easily holds up all the tactical tools or the field instruments or the study items. It is really a favorite choice for the students, geologists and military professionals. In our SOG backpack review, you can really tell that this pack has a lot of features. 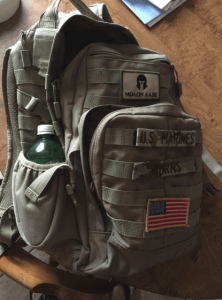 The MOLLE feature makes the bag feel lighter. Its 2.4 pounds weight is very light on our shoulder and its tough fabric allows us to carry rough items with no fear of tearing. It comes with a hook and additional Straps. While in a field study or hiking, we often tend to take extra collected things which requires much more space than the available one in our backpacks. So, in terms of SOG ninja daypack digital camo, this SOG pack can be a great alternative. The bag also has a hydration pocket with left and right hydration hose port and side pouch which fits most water bottles. It is well facilitated for your easy refilling in dehydration prospect with the best hydration system. One additional feature is the tight and elastic grip of the bottle holder. The grip does not allow the bottle to slip and jump out while running or traveling. Can I use it as a Laptop bag? Yes, 15” laptop can be easily carried. It rarely gets wet inside and dries quickly, but it is not water resistant. Can the backpack be used for Field trips? What is its inner measure? The backpack is big enough to carry field items. It has a big inner compartment which measures 18 inches tall 9.5 inches wide and 7 inches deep. Does it has a waist strap? It lacks a waist strap. Can the backpack be taken in flights/airplanes? Yes, it fit’s cabin baggage measurements and it can be placed under an airplane seat if it’s not overstuffed. Does it has MOLLE compatibility? 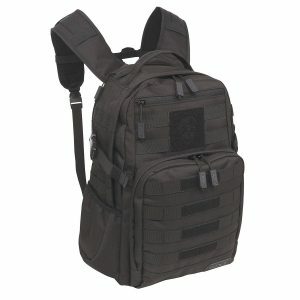 It has full MOLLE compatibility with hooks to attach further add-ons. Will it hold a normal water bottle of a liter? Yes, it has bottle compartment. What is the overall volume in liters? The backpack is very durable. It has well protective flaps and zippers. There are lots of daypacks that are available in the market. Tailoring your purpose of buying to the product you are checking out will help you make a success purchase and “less regrets” after the purchase. 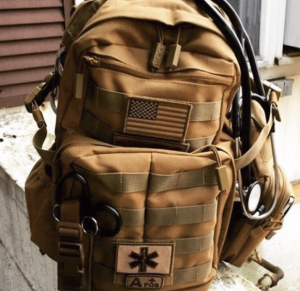 The SOG Ninja Daypack is one of the best available daypacks in the market, it’s a basic bag that you can carry around daily, occasionally or on field trips. Click here to see the lowest price available.